With more and more Filipinos getting exposed to Japanese culture, it's no wonder why Filipinos can't stop eating Japanese Food. Everything is done simple yet on point. Thankfully another Japanese inspired restaurant opened up recently. 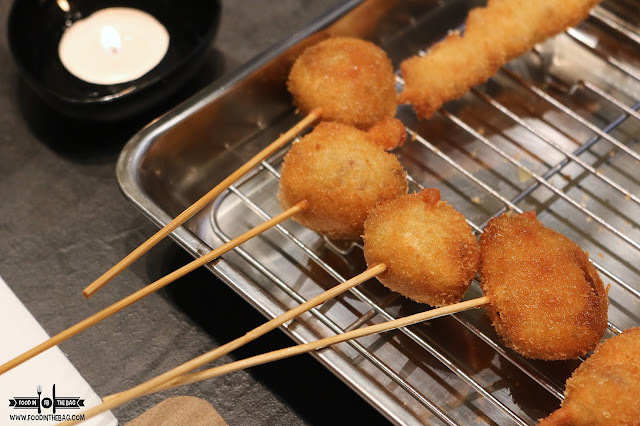 From the guys that had concepts such as Bad Bird, Le Petite Souffle, Hey Handsome, and even Freezer Burn comes KUSHIKATSU DARUMA. 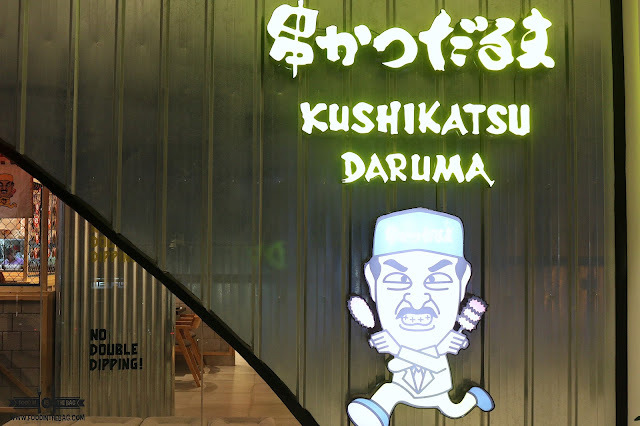 Located on the 2nd floor of UPTOWN MALL in BGC, KUSHIKATSU DARUMA is a franchise from the ever popular chain in OSAKA, JAPAN. The interiors are quite quirky and fun. Opposite of the plain and proper looking branches in Japan, this one is more playful. 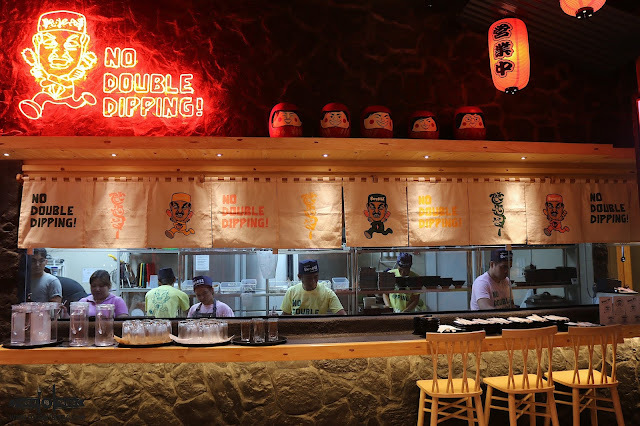 Surrounded with different anime drawings and constant reminders of NO DOUBLE DIPPING, kids and families would enjoy the place. 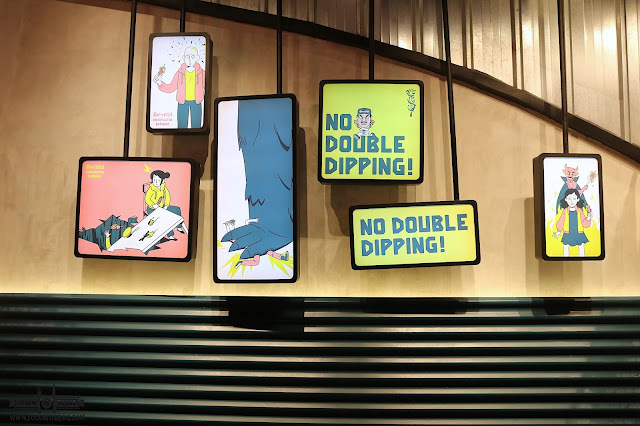 Remember that no double dipping applies to everyone. 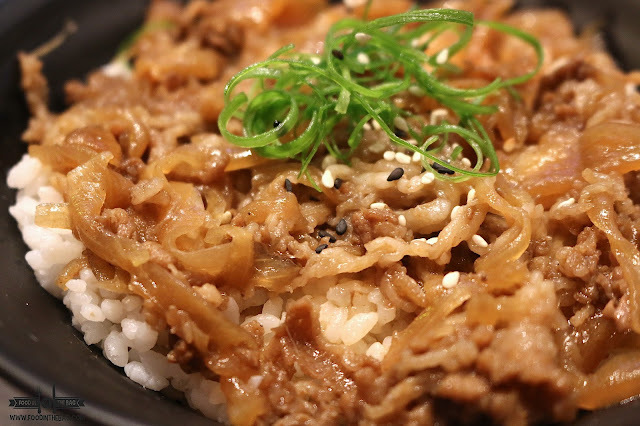 As the sauce that they serve are placed in communal bowls, you get to taste the flavor of sweet, salty and somewhat teriyaki with miso. Owner Charles Paw reminds everyone to eat them while they're hot. No time for that picture as everything taste better fresh off the frying pan. 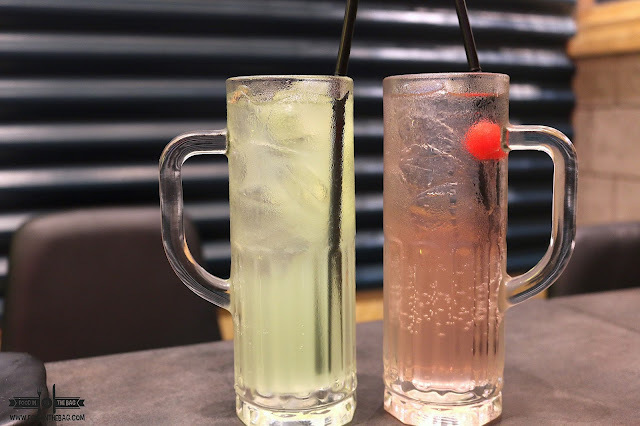 Guest could choose between sets or individual orders. Each stick is placed on the tray as they are cooked. Not everything is served in one go. This ensures that the freshness of each item. Surprisingly, each bite doesn't give you that rancid and overly oily feeling. Everything is done by the book. 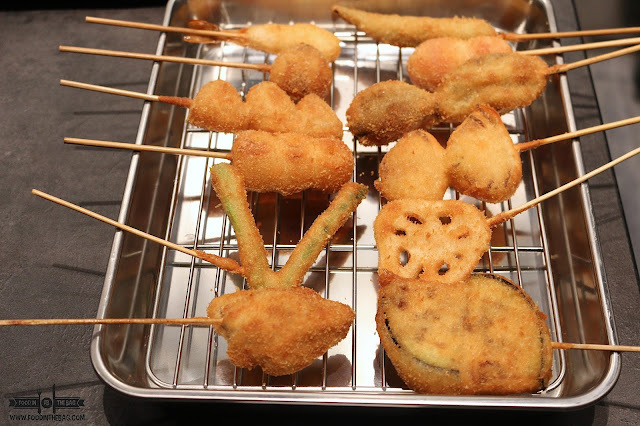 Admittedly, KUSHIKATSU DARUMA main draw is their deep fried sticks. Different cuts of meat, vegetables, intestines, offals, and even dessert could be ordered. For beginners, the shrimp is a must. 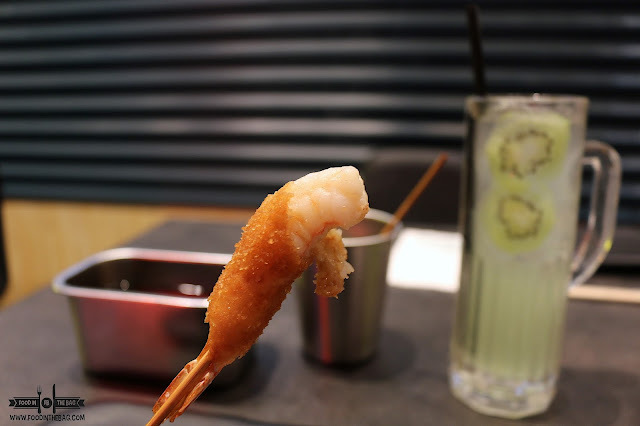 It reminds you of that tempura but with a closer resemblance to an ebi fry than a tempura. The batter is crisp while the meat inside is moist and delicious. 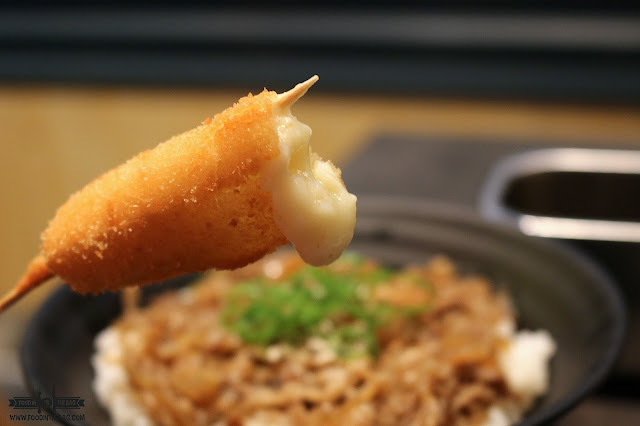 Hands down though, crowd favorite would be the CLASSIC KUSHIKATSU. This is their beef deep fried. Glorious meat that would be excellent with anything. Cheese lovers would rejoice with the CAMEMBERT CHEESE. It's gooey perfection is just wonderful. A bit on the heavy side but it is a definite must get. For someone more adventurous and enjoys something buttery, the FOIE GRAS is a must. Although not yet on the soft opening menu, this one is worth the wait. One bite in and it will get you hooked. 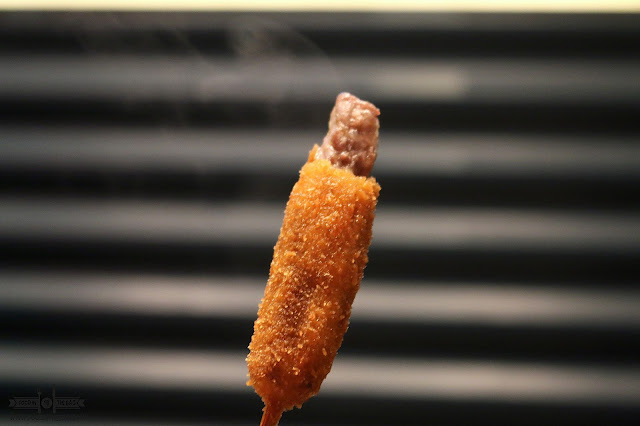 Filipinos would really enjoy these deep fried sticks. Thankfully, they also have rice bowls to partner them with. As Filipinos are behemoths when it comes to rice, a perfect partnership between the two is undeniable. 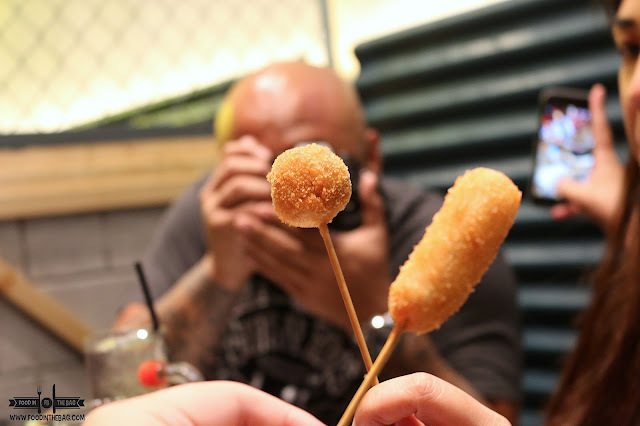 Furthermore, KUSHIKATSU DARUMA serves different cocktail mixes and beers that would work well with anything you order from the menu. Dessert is surprisingly smooth. 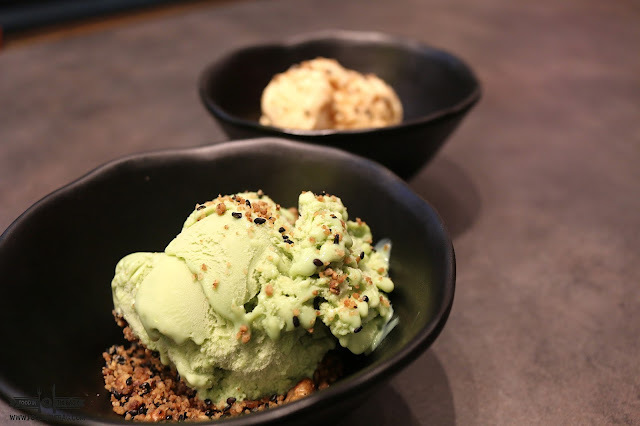 One could go for a matcha ice cream or a miso and caramel version. Both has a mix of sesame seeds to add to the texture. 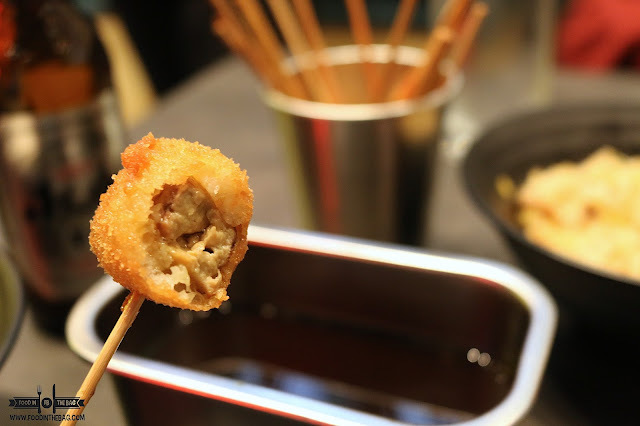 KUSHIKATSU DARUMA is a welcomed addition to the different Japanese restaurants in the metro. They are currently on a 11am to 11pm shift. After a couple of weeks, they will extend their operating hours to 3am. Perfect for an after late night party to get that buzz away.